In short the trip was fantastic. Your arrangements worked perfectly and each location exceed our expectations. Sarah and i are very grateful to you for putting together such a great trip. The arrangements and the travel instructions were impeccable. At each destination the guides where professional, polite, organised; it was so reassuring to relax into the trip as we became confident of your flawless preparation. 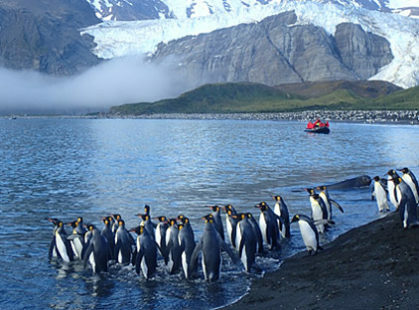 As a group of three girls we were a bit uncertain about how to go about organising our trip to Antarctica. After being connected with South America Travel Centre through a travel blog we attended an information night where Alex really whet our appetite. Alex and Hayley answered all our requests and we finally had our itinerary. The team at SATC are passionate about the destinations the recommend and having travelled there, have first hand knowledge. 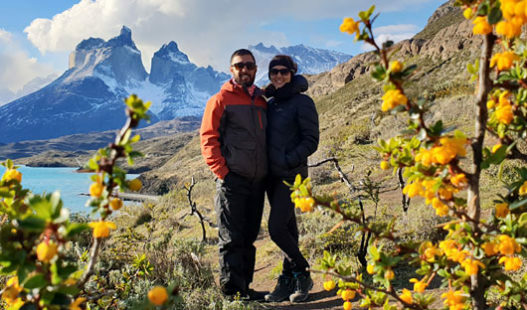 We travelled to Patagonia, Chile staying at the Cascada EcoCamp in Torres del Paine, which was amazing. We then flew from Punta Arenas to The Falklands to board our expedition boat, the Akademik Ioffe for the most amazing experience. 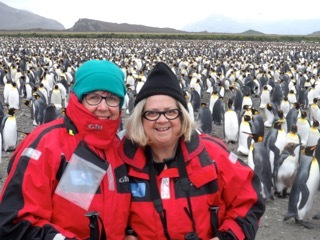 We saw the incredible sights from 500,000 King penguins on Salisbury Plain to Humpback and Minke whales in Fournier Bay. Hayley recommended we take up the option of kayaking as only few people aboard the boat get the opportunity. Not being experienced we were a little nervous but did a day course before we went, to be a little more familiar with techniques. 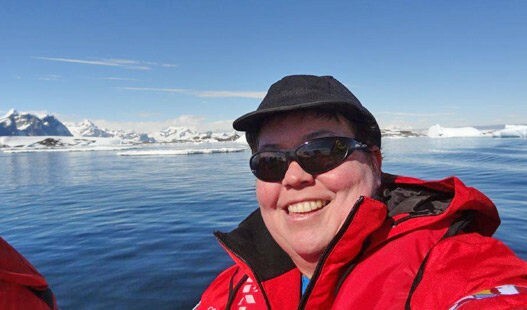 It wasn’t easy but it was a huge highlight to kayak through icebergs, seals and penguins. After our wonderful boat trip we travelled to Buenos Aires on our way home. We had a wonderful guide, Monica who showed us the cultural and culinary delights of Argentina in the best city tour I’ve done. The organisation and scheduling of our trip was wonderful. We were reliably met at airports and transported to hotels and other destinations. Fellow travellers were very impressed with our very colourful compendiums which contained so much useful information. Since returning I have completed my photobooks which suitably impress everyone I show. Thank you for always being so helpful on the phone and sharing your enthusiasm for such an amazing destination. I have now visited the 7 continents! Each pickup/drop off was on time. My guides were very friendly, had great English, and were passionate about what they did. All hotels were faultless. I would have to say that Andrea from Buenos Aires was the best guide of a fantastic bunch. Andrea was there to greet me on my first arrival into BA, took me to the ferry for my trip to Colonia and made sure I was checked in, and was there to pick me up. She was also there to send me on my way to Ushuaia at the ungodly hour of the morning and pick me up again after the cruise, to sending me on my way the next day to Iguazu. I was most impressed at the efforts the guides went to in order to streamline the check-in process at the airport, making sure I got to the immigration area. I have never seen or experienced such attentiveness or helpfulness. Our trip was absolutely outstanding thank you so much for your incredible efforts in what was such an incredibly short turn around. We are so grateful, it was the most amazing trip and every day was as good as the other! 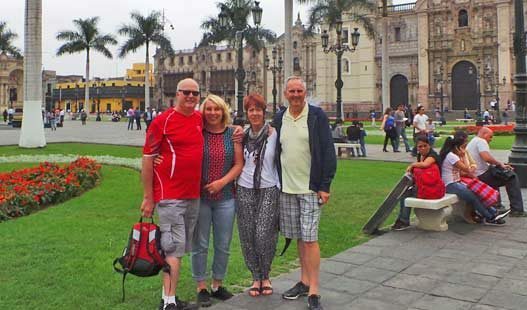 Anyone who has asked about our trip or has mentioned they are travelling or wanting to travel to South America I have put them straight onto South America Travel Centre. Thank you for all of your prompt responses, quick turn around and thorough knowledge, understanding, expertise and advice. Your service was second to none. It was outstanding and we are truly grateful. Please pass on our gratitude to the wider team as well for helping pull a once in a lifetime experience together for us in three days! We are so thankful for the afterhours and overtime you put in also, we couldn’t have had the amazing trip that we did at such late notice without you. We are a couple in our late 60s. 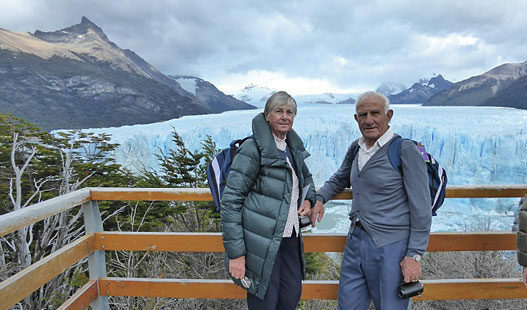 Following our fantastic experience dealing with the South America Travel Centre (SATC) in 2014 when we travelled north from Chile through Bolivia, Peru, Ecuador and the Galapagos Islands, we had no hesitation contacting SATC again to arrange our second South American experience, this time south in Patagonia. After clarifying our expectations of budget, times, and fitness levels, SATC proposed an itinerary that suited our needs in every way. A great mix of some cities, regional towns, mountain villages and our highlight – the Cascada EcoCamp in Torres del Paine. Our itinerary package again covered every possible detail we needed. As with our first trip we included transfer services at every stop-over that ensured we were met by friendly, reliable English speaking local transfer operators who were waiting at airports, bus stations and our hotels etc to welcome us and take us to our accommodation, or collect us and take us to our planned excursions. This always makes us feel very secure and organised. The hotels were all ideally suited to our budget needs, centrally located for easy exploring and getting around, and operated by friendly English speaking staff. The quality of all the transport – buses, boats and planes was excellent. Back home safe and sound after an amazing holiday. Cannot say enough about South America Travel Centre – and will definitely recommend to anyone travelling to this continent. The guides were delightful, and drivers were very careful and drove to conditions. 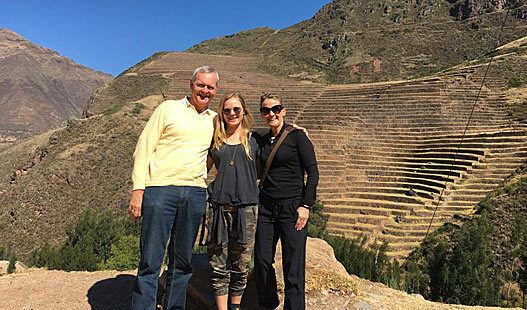 All accommodation suited our needs – especially loved Arequipa, Colca Lodge, Ollentaytambo and Inkaterra Amazonica!!! The care of your staff was above and beyond when situations arose due to not feeling so good. The day we left Colca Canyon Sue was unwell but Beatriz was amazing and after 24 hours all was ok. John requested medical attention on return to Cuzco and within 20 minutes a Dr appeared and then short time after a nurse appeared with medication – just fantastic. A big thank you to you for all your organisation and for playing a big part in making this holiday such a memorable one for all us. We thought we’d drop you a line after returning from our “highlights” tour to South America. Thank you! We found our itinerary absolutely perfect. By that I mean not only were our superb boutique hotels great, the guides in each city friendly, courteous, well-spoken and knowledgeable but the time in each city or location and the balance between site seeing “work” and leisure time “play” was also perfect. The most difficult question by friends on our return has been “what was the highlight”. An impossible question when considering the merits of, inter alia, Galapagos Islands, Machu Picchu, Iguazu Falls, Christ the Redeemer, Inti Raymi Festival, Lake Titicaca. 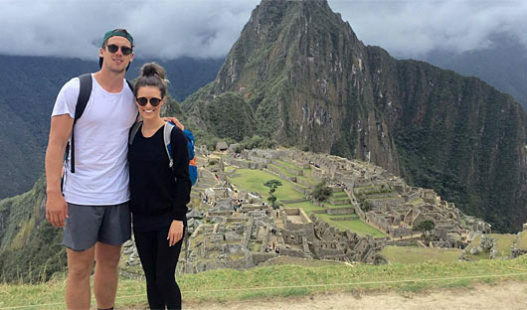 The purpose of our trip to South America, in truth, was to see as much as we could of the continent with a view to probably not returning as we explored other opportunities. I have to now say that the chance of us revisiting South America is extremely high. One of the most delightful things after travelling long distances is to be met at the airport, bags carried and be taken to the accommodation. It is just so good to see that sign with your name. 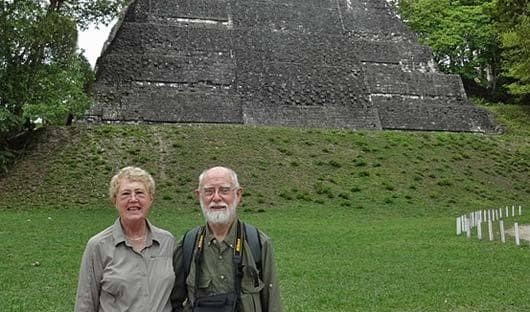 Our latest itinerary with South America Travel Centre, took us to Costa Rica, Guatemala and Honduras. Costa Rica was about flowers, wildlife, volcanoes and zip lining. Guatemala and Honduras were about Mayan ruins with some wildlife in between. Although it was the rainy season, we found that rain sometimes occurred as a thunderstorm in the late afternoon, lasting about an hour. It was always a delightful surprise to find that our accommodation is not in a multistorey type edifice but in an architecturally interesting building with fascinating décor and views. We found this at each place we visited. Many of the breakfast rooms had a wonderful view of water, forest or volcano where we could sit and enjoy the local tropical fruits. Breakfast always included tropical fruit and fruit juice. We have returned home with photos galore. Firstly, I can’t come up with enough adjectives to describe the sensation and all the ‘Wow’ factors in this trip. The incredible amount of work you put into the planning and organising really paid off. The South America Travel Centre documentation provided in the pouch before the trip was excellent. The selection and sequence of things worked well. The spiral bound book was used a lot during the trip. And on arrival back home, a pleasant surprise CD from your company. At each new city, we were met at the airport on time by the guide and usually a separate driver. We then had a review of the itinerary, pick-up times, etc., and discussed any other issues that may pop up. The vehicles were clean and comfortable. The guides all spoke good English and were all passionate about what they do. Most of them had been doing this for a long time, but I never felt that this was just another day on the job for them. They offered suggestions for restaurants and other activities, which we took up in a few occasions. Tickets and vouchers were always correct and complete. Even on departure from a city, the guides were often able to push us though the airline check-in procedure on the fast-track – we didn’t just get dropped off at the curb – even at 3AM. So, overall, the experience was wonderful. I don’t think I ever want to do a bus tour again! The chosen hotels were all very good to excellent to grand, and again the guides always made sure that we were properly checked in. Hotel locations are very important as this allows easy walking around the neighbourhood to explore at one’s own pace. In that respect, the Sol Y Luna was out of the way, but this was more of a resort and the only one like this, so OK – and very nice. In hindsight, we had just enough ‘down’ time at various places. Any less might have been problematic, as touring around is quite exhausting sometimes, especially at altitude. More down time would have been nice, but then the overall duration of the holiday was already quite long. The altitude slowed us down a bit, but didn’t really stop us doing anything. In fact our first day in Cusco was supposed to be an acclimatisation day. Yet we had to tour a couple of places the same day because of the Easter closing times looming and we managed OK.
Estancia: Fabulous, and we even got a chance at horseback riding and mustering some cattle. Rio: Our guide was able to pick the best times and days for the Corcovado and cable car trips, based on his local knowledge of the weather patterns. We managed enough clear skies. Aqua Amazon: The overall cruise was magnificent and the ship was a delight – it looked as great as the brochure. Guides on board were very knowledgable. 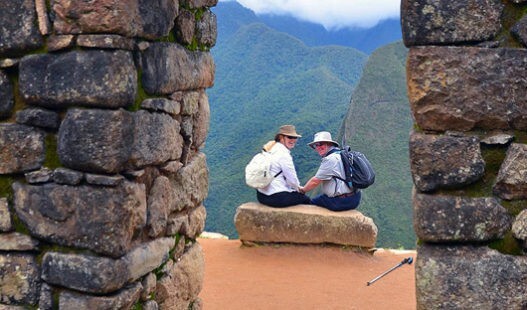 Train trips: Both the Machu Picchu and then the Andean Explorer. Fabulous train journeys. I love the open bar car on the Explorer. Machu Picchu: the weather was perfect our first day, and the place looked just like in National Geographic pictures. 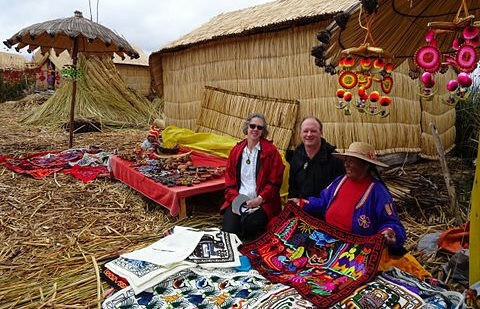 Puno & Lake Titicaca: visits to the Uros (got to row one of their boats) and Taquile Island. So, overall a ‘high five” for you and your team and agents. Thank you very much for your efforts and hope that our paths will cross again at some point in the future. 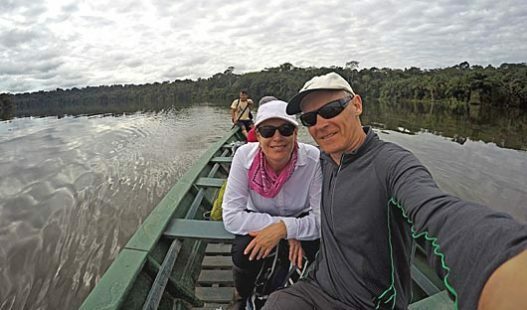 We have now been back from our wonderful holiday to South America for about 2 1/2 weeks, and I wanted to thank you very, very much for arranging such a fantastic trip for us. Everything went so smoothly, from the airport pickups, to the guides and drivers, to the wonderful accommodation – everything! We kept waiting for some little blip to occur, but it didn’t! 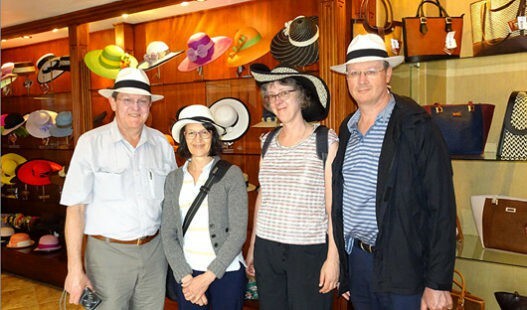 You provided us with such a varied itinerary, we kept busy the whole time, and thoroughly enjoyed the whole trip. 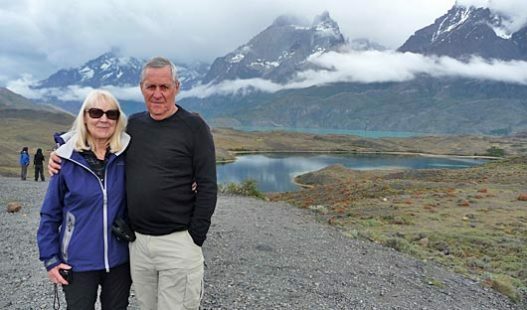 We both particularly enjoyed the Galapagos cruise, and also Machu Picchu. We all four climbed Huayna Picchu on our second day back at the site, and it was well worth the effort. 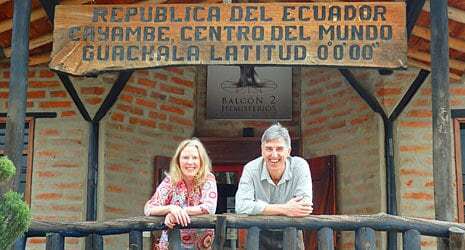 Our guides and drivers were fantastic; we particularly enjoyed Silvia our guide and driver Marquito for the 5 days Andes experience in Ecuador. Once again, thank you so much for using your talents to give us such a memorable holiday. We will certainly be recommending you to our friends. I write to thank you for organising our recent trip to South America. Everything went like clockwork, and the arrangements were very satisfactory. The guides always turned up at the right time, and the people meeting us at the airports were always there. We had a wonderful trip, and we will have to plan another one now, so that we can see Brazil, Argentina, Bolivia and Uruguay and maybe more. But first it’s back to work to earn some more money! For me the greatest highlight was Machu Picchu; it far exceeded my expectations. Having local guides and local knowledge was sensational and gave us a great insight into the cities and countries we visited. We loved the whole trip. One very big positive was every single time we arrived at a destination, there was someone already there to meet us and a transfer waiting to take us to the hotel or airport. We didn’t use trains and only used buses in Cuba which were very good for what we were doing. Our SATC consultant and her knowledge and experience was invaluable in both the lead up and the trip itself, with numerous hints and tips being very useful as well. The detail and documentation provided was excellent throughout and we used it extensively on our trip. We had a fabulous time!! The countries we visited have such a rich and fascinating cultural & geographical diversity. We loved learning about the Incans and visiting the ruins in Peru, we loved seeing all the creatures of the Galapagos Islands and the volcanoes of Ecuador. We loved the magnificent scenery of the Atacama. What a fantastic palette at sunset! The adobe hotel, Altiplanico, was wonderful & San Pedro de Atacama was a funky place. We appreciated the structure of our holiday too, there was a nice blend of guided time and free time. It was nice to be in one place on the boat in Galapagos after moving to a different place each day through Ecuador. Some of the haciendas we visited would be lovely to stay for a longer time. Everything went very smoothly in terms of timely airport transfers & pickups, informative and friendly guides/drivers at all times. The local people were very friendly & were helpful with our attempts at speaking Spanish. We enjoyed the cuisine very much & look forward to trying some home-made Locro de papa soup & Pisco sour. Thanks for helping us with a great holiday.